Estuaries are subject to high environmental variability coupled to tidal salinity shifts. Under restricted freshwater flow and prolonged drought conditions, salinity may exceed natural ranges and thus organisms may experience stressful hypersaline conditions. This study assessed the physiology of a juvenile marine estuarine-dependent species Rhabdosargus holubi (Family: Sparidae) under changing salinity to determine the impact on respiration and survival under shock and acclimatisation exposures. 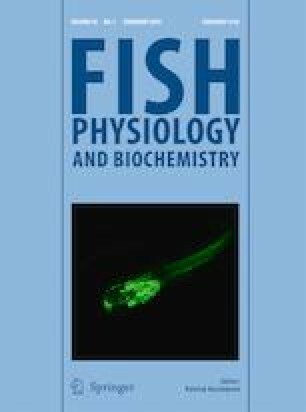 Oxygen consumption was not significantly different in the 2.5 to 45 salinity range and the interaction between temperature and salinity was not significant at the moderate levels tested. This confirmed the strong osmoregulatory capabilities of marine estuarine-dependent R. holubi. However, respiration was impacted at salinities of 55–62.5. The salinity tolerance ranges of R. holubi were expanded beyond those previously observed in the laboratory, to a maximum of 77 when fish were gradually exposed to daily 20% incremental changes. This indicated the ability to adapt to hypersaline conditions that occur gradually in anthropogenically altered estuaries which is an important aspect for management decisions regarding freshwater inputs. The adaptability of Rhabdosargus holubi to hypersaline conditions in estuaries may thereby ensure the maintenance of populations in the short term under certain environmental conditions, such as those currently occurring in a freshwater-scarce South Africa. However, in the long term and at more extreme salinities (> 55), the physiology of R. holubi and similar species may be compromised, thus placing the species at risk. This research was funded by the National Research Foundation (NRF) and the Department of Science and Technology (DST) as part of the South African Research Chairs Initiative (SARChI). Further bursary support was kindly provided by the Nelson Mandela University (NMU). Dr. S Paul thanks the Department of Science & Technology, Govt. of India, especially the DST Inspire Faculty Award (DST/INSPIRE/04/ 493 2016/000036) for his fellowship and the University of Calcutta for providing facilities during manuscript preparation. Ethics clearance was obtained from the Animal Ethics Committee of Nelson Mandela University under the protocol A14-SCI-ZOO-001. Any opinions, findings and conclusions or recommendations expressed in this work are those of the authors and the NRF does not accept any liability in this regard.